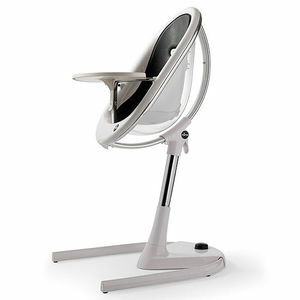 The high chair seat can loosen and dislodge, allowing the seat and child to fall. The chair can also fall onto a child crawling underneath the seat, posing an impact hazard to the child. No injuries have been reported. This recall includes about 1,470 Moon model 3-in-1 high chairs which adjust to a newborn, high and junior chair with a unique design consisting of a base with two feet supporting a single post that holds up the seat in a clear shell. The shell has a white inner seat with a removable seat pad in white, camel or black. The high chair measures about 3 feet tall when in its highest position. There is a "Mima" logo where the metal post attaches to the base to the seat. There is also a "Moon" logo on the inside of the feet that form the base of the high chair. The majority of the high chairs were given away at the 05/09/2014 taping of the Ellen DeGeneres television show. The remaining chairs were sold at children's juvenile product stores in California, Colorado, Connecticut, Florida, Georgia, Illinois, New Jersey, New York, Puerto Rico, Texas and Virginia from February 2014 - September 2014 for about $500. Consumers should stop using the high chair immediately and contact Mima at (800) 392-1206 to receive a free replacement upper chair section or instructions on receiving a refund. Mima at (866) 770-0056 from 9 a.m. to 5 p.m. PT Monday through Friday or online at www.mimakidsusa.com and click on “Moon Recall Information” for more information.